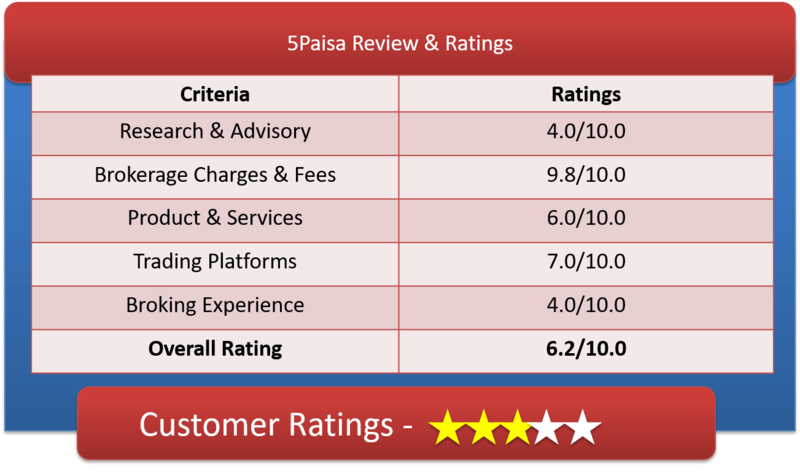 5Paisa is one of the well-known discount broker based out of Mumbai. Lets have a detailed 5Paisa Review & get good understanding of 5Paisa Brokerage Charges, 5Paisa Demat Account, 5Paisa Trading Platforms & other important features. 5paisa was launched in the year 2007 and as on date serves more than 7,500 retail customers. It has targeted to acquire around 50,000+ customers in current fiscal period. The customer base is entirely new and is not acquired from IIFL. The broking house is in the process of demerging from IIFL and is also in the process of getting listed on the stock exchanges. 5paisa has planned to commence trading in commodities and to offer personal loans in near future. It also intends to include funding products like IPO, NCDs etc. as a part of its product profile – this is planned to be routed through a NBFC of IIFL Group. They does not have any major investment infrastructure. They only has a set up office in Mumbai, apart from this, it does not have physical presence in any other part of India or world. For assisting the customers, it has set up a call center format. The Discount broker has been recording a daily turnover of INR 1,200 crore which is mainly from equity trading and a miniscule portion, say around a percent is towards currency. It has also been found mentioning that the growth in number of customer is cent percent when compared quarter over quarter. Around 60% of the client base is based out of tier III and tier IV cities. A flat fee of INR 10 per order for any kind of transaction across all asset segments. As per the personnel of 5paisa, the brokerage charged by them is almost 45-50% lower vis-à-vis that charged by other discount brokers. Further, in comparison to full service brokers, the rates are as low as 98%. It charges INR 650 for opening a trading account and the AMC is Nil. For DEMAT account, there are no account opening charges but an AMC of INR 400 per annum. It is interesting that in case an investor has an old DEMAT account, he/she can continue with that by linking the same with trading account and need not open a fresh trading account. How to open Demat account with 5Paisa? Why Open 5Paisa Trading account? 5paisa’s research & tips services is entirely dependent on their robo advisory platform. This robo advisory platform provides daily stock tips, weekly stock performance & other recommendations. But they lack actual technical research from top research analyst. It offers a mobile app based trading platform i.e. 5paisa app. This is an on the go kind of trading platform. It allows execution of trade orders, lets one track the current movement of his/her stock, one can look into the net position, order book, trade book and margins. It also allows an investor to create his/her own watchlist i.e. customized watchlist. Apart from trading, one can also access mutual funds investment so that the investor can look for available funds, track the position of ones owned fund and trade in funds. Thus, this app takes care of account opening, trading, back-office processes and query resolution. “Trade Station”, a browser based trading platform which works on google chrome, firefox and internet explorer. It is a fast speed trading platform and allows one to trade in equity, derivatives and mutual funds. Most importantly, it allows transfer of funds from and to one’s bank account. “5paise Trade Station” is a desktop based trading platform. It offers all the advanced analytical tools and charts. Based on the current portfolio, the system flashes suggested scrips, trading ideas to the investor. Mutual funds can also be accessed from this platform. Here are the total number of complaints lodged & resolution status of 5Paisa for the current year. The broking house do get sizable volume of complaints but they resolve them at a very high speed. NOTE* – Their TAT for resolving any kind of complaints are 7 days. This is extremely good. Has an advisory system for guiding investor on what MF to opt for and what amount to be insured etc. The broking house doesn’t support any kind of offline activity, hence, they don’t have any branch available across India. They are end to end Online Set-up. Among the Discount Broking house, 5paisa is growing at a very fast rate. Their client rating is also decent at 6.2 of 10. Our critical experience into stock broking suggests that go with 5paisa if you have a good trading knowledge. Since, they don’t have offline presence & their own advisory service, they are not good for Investors. Their advisory is entirely dependent on machine learning, so there is a big chance of goof-up for new investors. Definitely open demat account with 5paisa, if you are a trader. Fill your details & Open Free Demat A/C Now! Still Confused! Fill your details & Get Free Expert Help Hurry!! !